Reed sensor market has lately emerged as one of the most lucrative business spheres of the global electronics industry, primarily powered by the shifting trends toward digitalization. Additionally, the escalating popularity of product miniaturization has led to a surge in the demand for reed sensors. In fact, reed switches are excessively used across various household and industrial electronic products, thereby propelling the industry trends. The increasing popularity of smart home appliances, self-driving vehicles, and industrial automation will also have a significant impact on the industry growth. 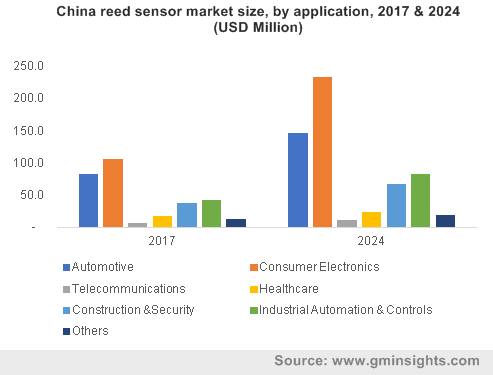 Nowadays, most of the consumer electronics companies have been developing advanced versions of existing products with the use of latest technology trends such as IoT and AI that has also had a positive impact on the reed sensors market size. Some of the noteworthy end-use businesses including automotive, security systems, and consumer electronics have been depicting a substantially high demand for reed sensors. These sensors are used in various electronic devices as fluid level sensors and proximity sensors. A gist of the significance of these devices, specifically in the consumer electronics sector, has been outlined below. In the era of digitalization, the advent of smart technologies has transformed homes and the usage of home appliances. As of now, most of the electronics devices manufacturers have developed a large range of smart kitchen appliances, that has been possible on account of sensors. From coolers to washing machines and sewing machines to food processors, home appliances have witnessed a commendable upsurge in functionality. The reed switch has successfully been integrated with coffee makers, dishwashers, and water heaters as fluid level sensors and in bicycle odometers, access panels, and appliance doors as proximity sensors. Currently, most of the consumers have been giving preference for comfort and convenience rather than slog away – the paramount effects of a sedentary lifestyle. In accordance, to enable quick operations, consumers’ have been adopting smart home appliances on a large scale. Regionally, China is one of the major producers of home appliances and electric vehicles, and has been propelling reed sensors industry. In addition to smart appliances, the increasing popularity of smart homes has also been augmenting the industry trends. In order to enhance home security for instance, core companies have developed smart security devices such as cameras, smart locks. Other smart home technologies such as smart meters have also been developed and used to monitor the water flow and prevent extensive flooding. In fact, with the significant use of reed sensors in the household energy appliances, it is quite possible to obtain the advantage of energy efficient returns. The increasing awareness regarding the usage of energy efficient electronic devices for minimizing the overall energy cost has thus been impelling reed sensor market share from consumer electronics applications. order to control the robotic motion, reed sensors have been incorporated heavily in these robots, and assist in sensing doors, hoppers, tracks, and valves. The prominent use of proximity and fluid level sensors to control speed, motion and the working platform of robotic machines is poised to boost reed sensors market share over the years ahead. The surging use of automated products for better life quality, good health, and energy efficiency will have a considerable impact on the product demand. Moreover, the growing popularity of smart homes is certainly anticipated to stimulate the industry trends over the years ahead. The shifting trends toward the increasing deployment of electric vehicles for reducing GHG emissions and energy efficiency will also further propel reed sensor market which will generate a revenue of more than USD 2 billion by the end of 2024.